It was a cold blustery evening with a strong Northerly wind funneling down the Penryn River past Flushing Sailing Club, for the start of the fourth Skinners Points series race. It was definitely not the night to go swimming, but our own Club Mermaid Jeannette missed the boat, literally, and had to swim for the shore. An early bath before the sailing and she didn’t even get her hair wet! Martin Page the Race Officer and his crew were taken to the eastern shore by Jack Penty in Noon Hi the committee boat. He set a Race Officer's choice course to keep the fleets north of the Harbour Entrance as Lyme Bay the RFA ship and two tugs were due to move at 1900 hrs from the docks seaward. The course was Start between the committee boat and Pin end to North Bank, then Trefusis, Waterloo, North Bank, Trefusis, Waterloo and finish at the club line. All marks to port. Eight Q class yachts came to the start area with 7 Starters; John Hicks in Rampage did not manage to start, as he could not get his No3 genoa to stay in the luff track. The fleet all took off on a starboard tack and went into strong, 20 kts plus wind, over a strong tide producing rough water in the main channel. Seven U class yachts started 5 minutes later, Aurora, Mandy Owens, took off like a rocket in the Folkboat. It was great to see Walter Amos back racing in Gulf Kilo, his old GK24 recently repurchased. Levity, Guy English, brought up the rear of the fleet having started several minutes late. Len Cheshire on Sweet Friday was disappointed not to be able to sail as he could not find crew. Anyone who wants to race white sail, i.e. 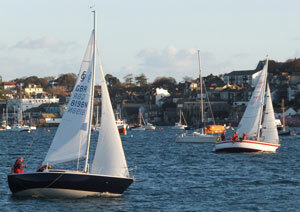 no spinnakers, please contact Len through the website. It is a shame because Robin Roebuck in Thirteen, painted in a new green livery, has decided to give Len some competition in W class and he came to the line to start. Per Elisa, Robbie Tregear led the Q class fleet and was hotly pursued by Ian Jakeways in General Khaos. There were some interesting moments on the second leg from North Bank to Trefusis when Excelle, John Fox flew a very shy spinnaker. He held it however and after a few near broaches gybed at Trefusis mark and carried it to Waterloo. None of the U class fleet were brave enough to attempt spinnakers and the fleet elongated into a procession with Aurora powering away, chased by Wilkie, Bob Chapple, Gulf Kilo and Trifle, Chris Jelliss. Popincoota, Alan Grose had a late start and was playing catchup from Mary Boon, John Cruise. Levity had had enough of the wind and made an early exit retiring from the race. Robin Roebuck in Thirteen had started some 15 minutes after Q class and was not making a lot of progress in the strong wind. He retired early and was a little disappointed in not being given a shorter course. Per Elisa a very fast Half Tonner beat General Khaos, a westerly GK32 into second place by a mere 23 seconds at the finish. Well done to Ian Jakeways in the General for sailing so well. Excelle was third, some 5 minutes and forty seconds later. Aurora beat Wilkie by one minute and thirty one seconds. Corrected to a whopping four minutes and forty nine seconds on handicap. Mary Boon was third on handicap coming in three minutes and twelve seconds after Trifle beating her into fourth. Walter Amos who was ahead of Trifle coming up the harbour sailed inside the moorings and retired gracefully. Back in the bar we ate, and tapped into the Skinners Lushingtons beer. Mermaid Jeannette told her story and Nigel & Jess Rowe appeared from Loe Beach where Kaimana their GK24 is moored. The strong offshore wind had blown their dinghy out to sea so they had to borrow another boat and mount a rescue operation while we enjoyed the racing. Don’t ask the Commodore which knot to use to tie the painter! The sun set on another successful evening, we all look forward to Saturday when the Cockwells Saturday points series begins.